Is he going to fire her off in a rocket now? Heh. 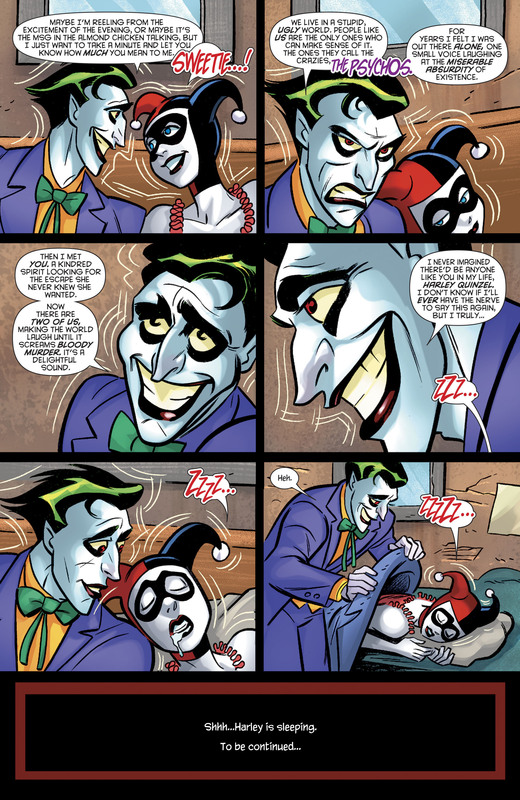 It is weird to see the Joker being kind and loving toward Harley. Talk about waiting for the other shoe to drop. I read that initially as "SMH..."
I am... concerned at Joker's super sweetness. And then Harley wakes up and realizes it was all a lovely dream. That might be the perfect ending to this whole thing. I concur with the above, this feels totally unreal. And I mean, it's not like any of it was real to begin with. Guess I'm the only one here who likes it when they're written like this. Granted, I can't really put it into words why I like this... Maybe I'm just weird. I'm liking it as well. I think Joker is more interesting when we see different sides of him as opposed to being the usual agent of chaos. What's the for-the-record deal with this, anyway? Did they soft-reboot Harley's origin? Harley's book has always been on the outskirts of continuity at best. If they were to pick a canon interpretation, though, they could do worse than to make this a contender.